• Running time: 115 min. The film was nominated for the Palme d'Or at the 2013 Cannes Film Festival, where Bruce Dern won the Best Actor Award. It was also nominated for six Academy Awards; Best Picture, Best Director for Payne, Best Actor for Dern and also Best Supporting Actress, Best Original Screenplay and Best Cinematography. An ageing, booze-addled father makes the trip from Montana to Nebraska with his estranged son in order to claim a million-dollar Mega Sweepstakes Marketing prize. 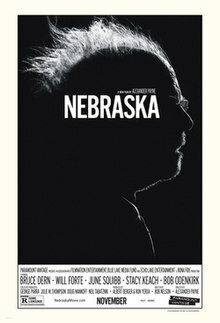 Upon its world premiere at the 66th Cannes Film Festival on May 23, 2013, Nebraska was met with almost unanimously positive reviews, with praise being directed to the acting (particularly Dern and Squibb), direction, screenplay, and cinematography. The critical consensus states "Elegant in its simplicity and poetic in its message, Nebraska adds another stirringly resonant chapter to Alexander Payne's remarkable filmography."